We love the Caribbean's high-low mix of glamorous resorts and laid-back beach bars. Whether you're looking for a luxury vacation or a low-key retreat, book a room at one of these new hotels for your next getaway. There’s nothing like watching the sun dip into the Caribbean—even better if you’re viewing it from the private plunge pool of your sleek room at the new Four Seasons Anguilla. This spectacular modernist cliff-top hotel gives you unobstructed views of the sea from every angle. At the beachfront Bamboo Bar & Grill, chef Rafael Gonzalez’s cooking almost upstages the scene, with dishes like saffron-braised local snapper tagine and addictive rotis. Rooms from $500 per night; fourseasons.com/anguilla. When it comes to the archetypal island fantasy, no place delivers quite like Anguilla. And when you throw open the wooden shutters to step out onto your private terrace at Zemi Beach House, a dreamy expanse of white-sand beach and clear blue sea lays out before you. Zemi is all about unique experiences, from the aromatherapy massages at the spa—in a 300-year-old house imported from Thailand, no less—to single-estate flights from more than 100 rums, curated by the hotel’s “rummelier.” Rooms from $350 per night; zemibeach.com. Look, the phrase all-inclusive resort usually sends us packing, too. But in Barbados, a place known for its smart British sensibility mixed with cool island vibes, the Waves Hotel & Spa redefines the genre. This is a resort that just seems to get it, from the food (lamb paella, red Thai curry shrimp in a coconut bowl) to the white-on-white design scheme to the focus on wellness (nice touch: Every stay includes a free spa treatment). Rooms from $366 per night; eleganthotels.com. While Punta Cana and its surrounding beaches are lined with massive resorts, the north coast of the Dominican Republic is surprisingly under the radar. 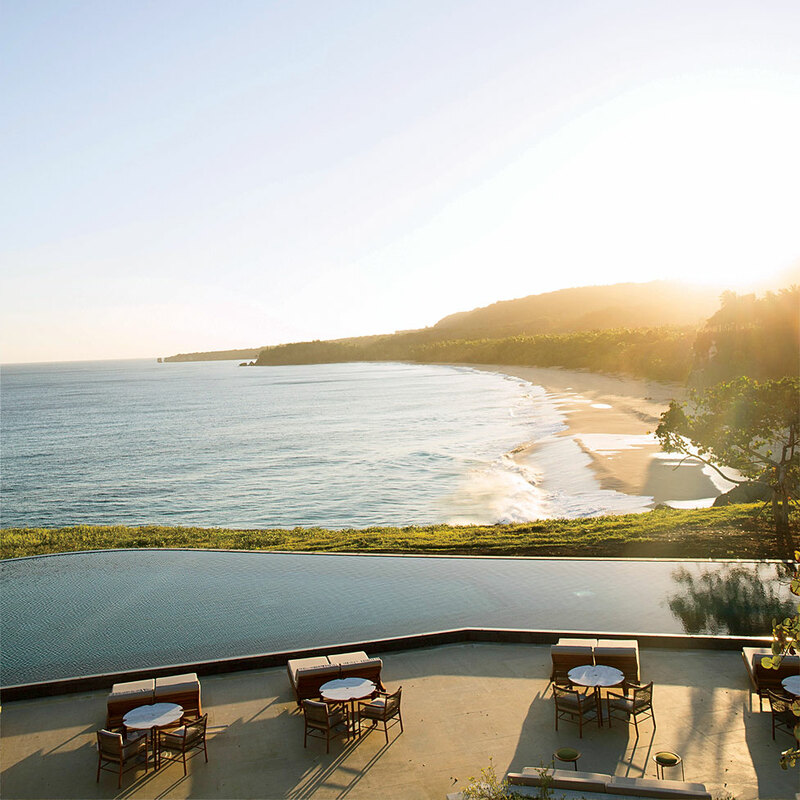 On Playa Grande, seven miles of untrammeled coastline edged by dramatic 60-foot cliffs and 2,170 acres of pristine Caribbean jungle, you’ll find Aman’s new 25-casita Amanera, which marries the brand’s signature Zen minimalism with Caribbean cool (cigar-rolling lessons with a local master, tours of the Ron Barceló rum distillery). Casitas from $950 per night; aman.com. The pristine waters and rich marine life of the Cayman Islands lure divers and anglers, while the eclectic food scene attracts chefs like Eric Ripert and José Andrés. The new Kimpton Seafire Resort and Spa on Grand Cayman’s Seven Mile Beach combines the best of both worlds: After diving and fishing, you can bring the conch and lobster you caught to the beachside restaurant, Coccoloba, for the chefs to prepare over an open fire. Rooms from $339 per night; seafireresortandspa.com. With residents like Mick Jagger and Tommy Hilfiger, Mustique has long been a hideaway for the ultrarich. Its sister island, Canouan, with its lush green peaks and neon azure water, has remained one of the best-kept secrets in the Caribbean, but not if Pink Sands Club has its way: It has poured $120 million into this elegant 26-suite beachfront property with eight restaurants and plenty of sipping spots. Our favorite is the Lagoon Café, where carafes of Pimm’s No. 1 Cup are always sitting out on the bar. Suites from $1,400 per night; pinksandsclub.com. The Cliff hotel on the undeveloped west end of Negril is a refined departure from the local Robinson Crusoe style of lodging. Sink into luxe rooms, meticulously landscaped grounds and pools that would look right at home in Palm Beach. Cindy Hutson, of Miami’s Ortanique on the Mile, and Delius Shirley, son of the famous Jamaican chef Norma Shirley, put a global spin on local cuisine at Zest—think curried octopus with jackfruit pilau and charred okra. Rooms from $260 per night; thecliffjamaica.com. Playa del Carmen can feel like a disco on the sea. For some serenity in a sophisticated setting, escape to Thompson Playa del Carmen, which runs a pair of hotels here. At the main property in the center of town, you can lounge by the pool on the sprawling roof deck and order food from the team behind Catch restaurant in NYC. Two blocks away, the boho-chic oceanfront Beach House feels like a members-only club. Hotel rooms from $249 per night, Beach House rooms from $349 per night; thompsonhotels.com. As the small riverboat meanders along a narrow waterway through thickets of mangrove-dotted jungle, you’ll feel like you’re in the Amazonian rain forest. Mayakoba, an eco-chic hotel development in Riviera Maya, was carefully built into the coastal landscape so as not to harm the fragile environment. The latest property to come aboard is Hyatt’s luxury boutique brand Andaz, which brings a youthful energy to the scene. Look for elevated street food at Olla Taco and a tequila bar at Olla Ceviche. Rooms from $500 per night; mayakoba.andaz.hyatt.com. The singularity of Villa Marie Saint-Barth is apparent the second you walk into one of the breezy bungalows and clock the vintage-style claw-foot tub, the seashell-macramé chandeliers, the bed draped in palm-frond fabrics and the high-backed rattan chairs. The hotel is the creation of Jocelyne Sibuet—the Martha Stewart of France—who has created a vision of the Caribbean circa 1969, complete with a restaurant that serves dishes like fresh-grilled Caribbean lobster and langoustine flambéed with aged rum. You’ll never want to leave—except that would mean you’d miss everything that superstylish St. Bart’s has to offer, from stunning white-sand beaches to incredible shopping. Bungalows from $560 per night; saint-barth.villamarie.fr.